Greetings to you, dear brothers and sisters in Christ! First, I’d like to thank you for your prayer support. It encourages a lot, and I’m grateful for your help in doing summer camp last year. It was a blessed time. We had about 40 children in the 8 to 14 age group in our camp, and 16 children repented. We had a very good team with ministers from three churches of our district. They all diligently did their tasks. Our youth helped the teachers, and at the end of the camp they made a decision to make a covenant with the Lord (be baptized) next year (this year!). It was a big joy for us! Last week we did a staff meeting to plan a camp for this year (2019). I’d like to share two stories of God’s work. After we finished the camp last summer, I talked to the village administration and asked for permission to organize a trampoline at the village square. Our two goals were to start new friendships to share about Christ and to raise money for the next year’s camp. While I was watching both children and parents who came to the trampoline area, I made an observation — children do not understand value of time and money. The trampoline cost 50 rubles for 5 minutes. Often, I saw that parents paid the cost, but their child was not active in using these 5 minutes. Then, the parents would encourage their child to be more active, explaining that they had paid the money. I can compare it with people who have no understanding that our time on earth is very short, and we will come before God one day. Also, many do not understand what price Christ paid for us. Unfortunately, people — like children — do not treasure the time and Christ’s sacrifice for us. I had the permission for the trampoline for a one-week period, and as the week was coming to the end I wanted to prolong the permission. At the square, I saw the deputy of the head of the Administration, Oleg, and I went to him with my request. We started our conversation about eternity since recently the Head of the Village Administration drowned. I had a good opportunity to share about Christ and salvation with Oleg, and he listened to me attentively. Please, pray for Oleg and for the planted seed to grow. Your gift helps send a child to summer camp to meet Jesus! Help send 30,000 children to SGA-sponsored summer camps. Thousands will meet Jesus … at last! Your gift will be used to send children to summer camp where they will hear the Gospel clearly. Pray that thousands will meet Jesus for the first time! Thank you for helping SGA sponsor these life-changing camps! Here is one more story — not about summer camp, but a good example of how God is bringing people for our witness. I was driving together with my wife Olesya to Durmin village for the service. The road is long and bad. One young man stopped us on the way and asked to give him a lift. Of course, we couldn’t stay silent. We introduced ourselves and shared about Jesus with him. His name is Dima. We told him about faith in God, what He did for humanity and that He sent His son Jesus to die for our sins. We only need to believe and accept His gift of salvation. At the end, Dima said that a man should rely only on his own strength and that no one can help a man who doesn’t help himself first. We explained that when a person believes in himself, then when he doesn’t manage to do something he will get depressed. Before he left, Dima promised to think about our words. Thank you for your prayers for the upcoming summer camp outreach to children that hearts will respond to Good News — and for people we meet in the community like Dima who need to hear about Jesus. 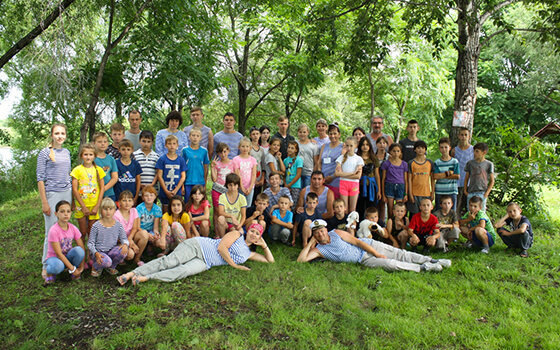 Your support for SGA-sponsored summer camps will help Pastor Oleg’s camp and 398 others that we are preparing for now. Our goal is to reach 30,000 children and youth in our 2019 summer camps. Your gift of just $41 will make it possible for a child to attend camp … and hear the Gospel!